Happy Friday!! I have another "skittles" nail art mani for you. 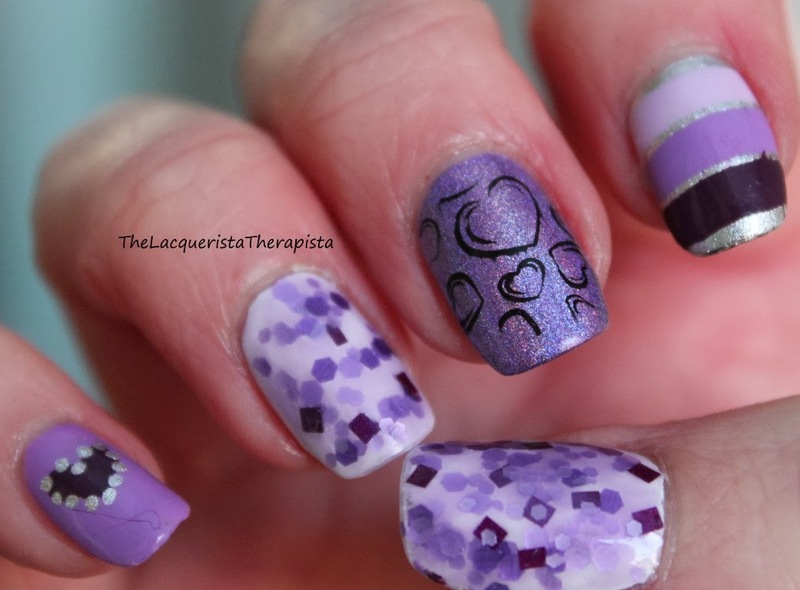 I had a hankering for a purple mani so I grabbed several of my favorite purples and made one. It was also in commemoration of World Cancer Day on February 4, 2014. 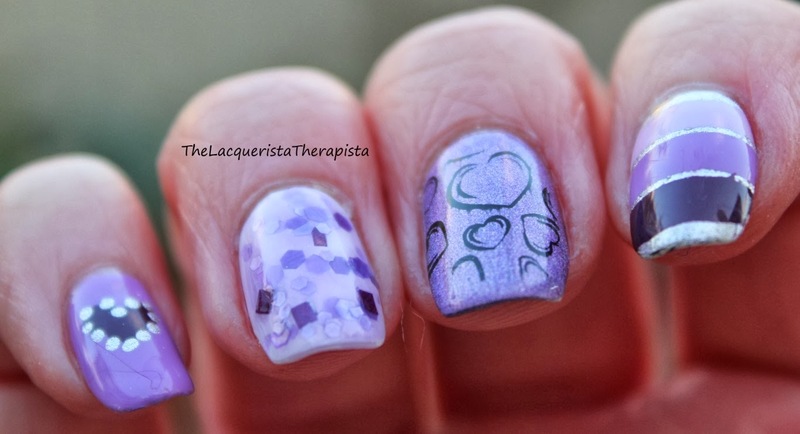 Thumb and ring finger are Whimsical Ideas by Pam - Persian Violets over Zoya - Purity. Index is Zoya - Trixie for the base. Then I used striping tape to block off 3 sections and filled with Julep - Gayle, Essie - Play Date, and Julep - Simone. 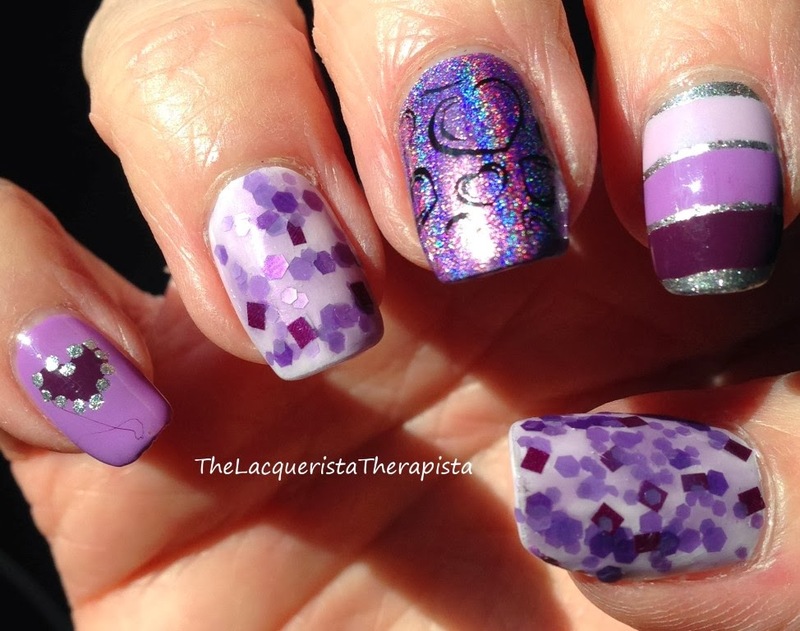 Middle finger is Color Club - Eternal Beauty with a stamp on top (plate: Bundle Monster 317 with Konad Black). Pinkie is Essie - Play Date for the base, Julep - Gayle for the heart and the dots are Zoya - Trixie. You might notice the smudging on my middle finger. I was a little too heavy-handed with my top coat and it smudged the black. Sometimes top coats can be tricky. The stamp didn't work out as well as I'd like either, but it wasn't really cooperating, in general, so this was as good as I could get it at the time.